Oh, for how long I've been wanting to write about this! For how long!! And now that I'am on the other side of it, I can brag about it with no worries. None whatsoever! Too many exclamation points, eh? Just proud and happy, that's all. 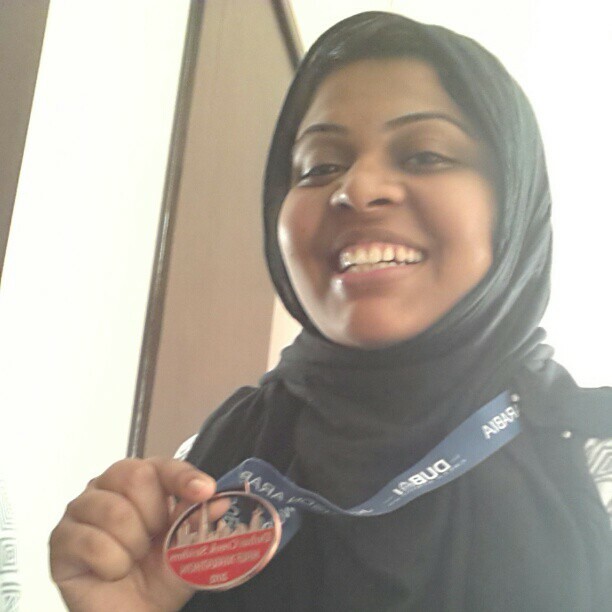 In early September, one of my book club buds, Samantha shared on her Facebook timeline, that she has registered for Dubai Creek Striders' Half Marathon. I had never heard about DCS before. But I thought, why not do it too? 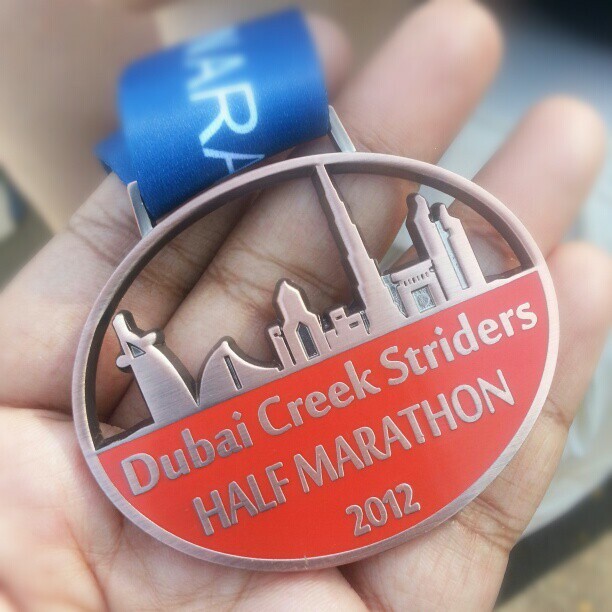 After all, Ive been wanting to run Dubai Marathon's 10k race for over four years now. Why not do this instead? But will I able to? 10k and 21k are two totally different things. And with no race experience (apart from a 3k fun run few years back), I knew I was being a bit too ambitious. Or probably being a fool? I wrote to Sam for some details. She was very encouraging. We had exactly three months to train and she said it was doable. So after couple of days of pondering, I just took the plunge and registered. aaaack! At this stage I was zero on exercises. Although I used to run/walk before, I hadn't done anything in over six months. And the temperature plus humidity was in the high range. But I got myself out somehow. Started with walks. Then slowly got to running. Very slow runs. I did a bit of research online and downloaded a running plan that I felt suited me best. I also joined the DCS group on Facebook to get some ideas. I lurked there all the time reading others' posts and picking up whatever I could. I wanted to join their runs, but knew at my speed I would never be able to keep up. I wanted to give myself some time, build up my confidence. In the meantime, Sam and I got together whenever we can for a run. Sam is a very fast runner, although she calls herself 'slow'. A very modest lady, I tell you. The kindness she has shown me is beyond words! So after improving from 'can't run 500m straight' to 'run 1.6k without a break', I was feeling strong and confident. I felt I could do this. A bit more of hardwork, a bit more of mentally pushing myself, I could do it. And then.. I came down with a horrible flu and cough. I was homebound for three weeks straight. It was worrying. Really worrying. I'am not a fast runner and neither do Ive experience with such long distances. Every week of training mattered. Last year, while training for Dubai Marathon's 10k I had fallen down the stairs and injured my tail bone. Which meant, no race. I worried whether the same thing was going to happen this year. I couldn't bear it! 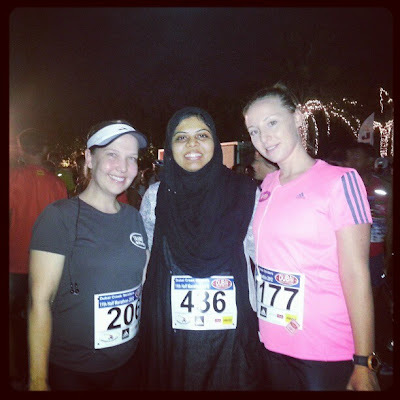 I wrote to Anja Schwerin, a runner, DCS member and food blogger in Dubai. We are also fellow members of the awesome food blogging community in Dubai called Fooderati. I was looking for some advice/opinion about whether I should get back into training or just think about another race. The reply I got from Anja was very encouraging. She asked me for more details and drew up a plan with loads of tips on how to get myself back to the track and keep training. I'am so touched by the kindness she has shown me.. someone whom she has never met! With just four more weeks to go, I had loads to do. But thankfully, my body listened. It didn't give up on me. I made a calendar (from the plan Anja gave me) for the next four weeks and stuck it on my fridge. I tried to eat healthy, tried. I was hungry and sleepy all the time. And feeding myself and three others was a humongous task. As the race got closer, I started worrying about what to wear. I usually worry about this way before the race and have given up twice. So this year, I decided to push it back to the list and concentrate on training. I started looking around for ideas. Although I found ready made hijabs in Naif souq, they didn't suit me. I also found Capsters through couple of ladies on Twitter. It was a bit too small for my taste and not enough time to get it shipped to Dubai. So I decided to wear what I usually wear - a long black Dupatta, that would not only cover my head, but also my upper body. Oh, before I forget - what an awesome race pack! I mean, vowza! Dry fit shirt by Addidas, bags, bottles, spaghetti, lotion, petroleum gelly, GU and so many other stuff. 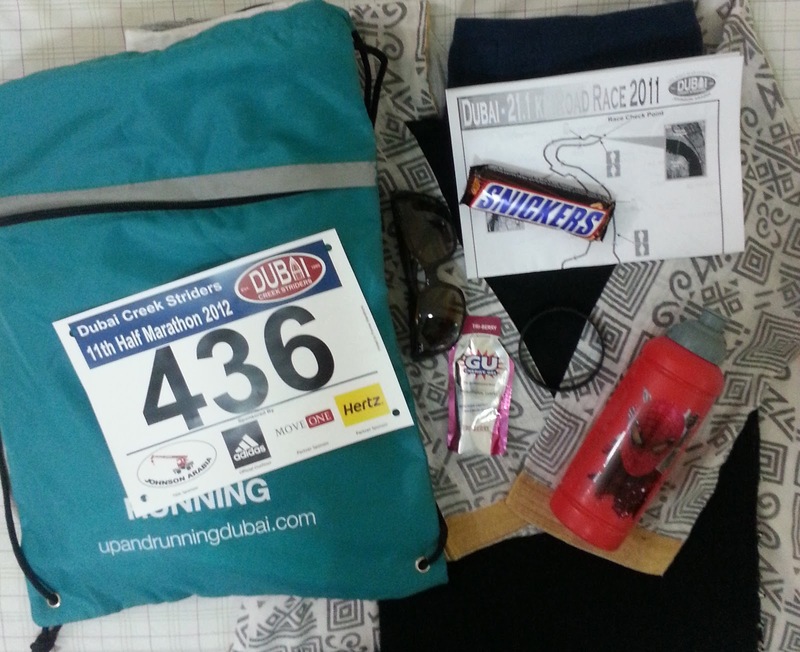 Fab race pack by Dubai Creek Striders! I still remember how nervous I was on Thursday. I was supposed to pack and keep things ready for the craft fair on Saturday. But I didn't. I couldn't. I just couldn't concentrate on anything. So I decided to cook something nice, something new. It was after all taper week where we get to eat loads of carbs. ha! And so I made an Arabic dish called 'Koosa Mahshi' or Marrows stuffed with Beef and Rice. Loved it! Plenty of proteins and carbs. I kept drinking water (and visiting loo a million times) to keep myself hydrated. Also got myself some fresh tender coconut juice from a nearby cafeteria. I had some brown lentil soup and bread for dinner. I was a nervous wreck. Oh good God, how will I do it?! What if I don't finish? What if... too many what ifs to list. I ironed my clothes, checked off items from the list of 'things to carry'. Checked the list again like a hundred times. Charged my phone till it got tired of me. Worried Sam with never ending questions.. Everything seems really funny now. After tossing and turning and waking up every hour, I finally woke up at 4am. I couldn't sleep anymore. I said my prayers, read the Holy Quran, made some breakkie for my family, had some brown toasts with honey and butter, some water, got myself dressed.. I was still nervous. I couldn't sit down for a second. I woke up J to help me catch a cab.. kissed my children goodbye and left.. 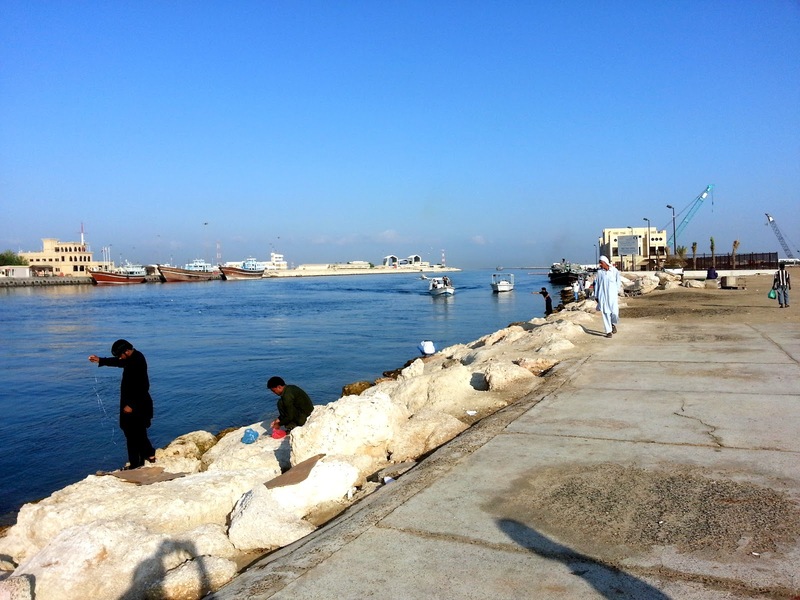 When my cab reached Dubai Creek Golf and Yacht Club, there was a mad rush at the gate. I felt good that I took a cab and didn't think of driving. Cabbie asked me what the rush was all about. 'Is there a party, madam?, he asked me. Lolz! I said 'ithney subeh subeh kya party bhaisaab?'. (What party early morning bhaisaab?). Like I said before, this was my first race. My first feel of everything related to a race. Everyone were hurrying towards the starting point and I just followed the crowd. After couple of tries, I managed to get hold of Sam over the phone and met her. Her friend Candice, Sam and I then dropped off our bag and waited for the call. Oh, we also had a good session of warm up by Fitness First. And the wait began... Once the pacers had left with their group, it was our turn. We were in the 2:30hours+ group (I hope Iam correct here). I had already told Sam that she shouldn't wait for me and should keep running. As we started, I fell back. Way back. All the while I was worried whether I would be the last to finish. And it looked like I was going to be. I know very well that I'am a slow runner. So I just kept running at my pace. I told myself I will catch up later. My goal is to finish the race, not finish within a given time. 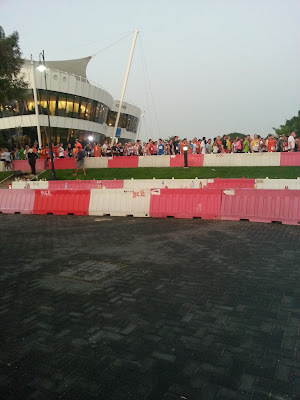 There were marshals every few hundred meters. There was a mobile ambulance and a marshal on bike (Audrey) who were trailing me and checking whether they were any runners who were injured. There were a couple. Apart from the rental chip we were given to time ourselves, I also carried the Edomondo app in my cell with me. Ive been using it for a while and although I use the basic version it serves my purpose - calculate time, distance, pace, calories and even save the map! I checked my time every now and then and felt I was faster than my usual runs. So I started feeling confident and felt I could finish this in three hours. And then.. those bridges.. the sun.. the humidity.. oh good Lord! I had to keep pulling myself together, think good thoughts, say prayers and sometimes cry out loud. Audrey kept checking on me every now and then and that felt really good. It was good to have someone to talk to every now and then as I was on the verge of giving up. Race course was near my home. And many times I thought I will just catch a cab and head back home. haha! But then I would remember Sam's promise to wait for me at finishing line. I would remember the feeling of finishing a race that Ive been wanting to experience. I would remember about all my friends on Instagram whom Ive been bugging with my Mamzar and Twar photos. And my blog and this post Ive been drafting in my head. I would think of all the training and time away from my kids. That would give me some more energy. And I just moved on. Slow. Sometimes walking. The race course was beautiful! And being a slow bum, it was not difficult to take a photo! By the time I reached 15km or so, my body gave up. Just gave up. I couldn't run or rather jog anymore. I tried. But I didn't want to go home either. So I decided to drag myself. Somehow. Anyhow. Audrey kept me company till the end. I was the last runner. Which meant all marshals and organizers were waiting eagerly for me. Everytime I reached a water stop or meet a marshal, Audrey would ask them to leave. Police officials would ask her whether Iam the last one. It was so embarassing yet funny! haha! I was a celeb. Everyone were waiting for me. Runner 436 was suddenly famous. heehee. I apologized to whomever I could - sorry to keep you waiting... so sorry.. thank you.. But everyone were very very supporting. There were so many school kids who had volunteered to be at water stops. Poor little darlings waiting in that scorching heat and sun! But they kept supporting me, giving me water, sponges, isotonic drinks and very motivational words and applause. I wonder what it would have been like if I didn't have such support during the race! And finally..... I reached the gate again. After crossing Garhoud Bridge once, Maktoum Bridge twice and Shindagha Pedestrian Underpass once, I finally made it to the gate. I have never been on foot on any of these in my life in Dubai and I had to do everything in one go! My glutton for punishment! Like Audrey said, those last few hundred meters were horrifying! Just horrifying. It was like one of those dreams where you are trying to run fast, but you just can't. Many were leaving. But they stopped and cheered me on. And I made it. I-just-made-it. After the finish I met Sam and had a light breakfast. My buddy had finished in 2hours:30minutes. Bravo!! So proud of her! By the time I reached, they were clearing up the breakfast table. I got hold of some muffins, pastries and sauted mushrooms. There were a lot of other food items too. I was too tired to notice or carry anything. Sam tried to get a photo of me. I said, no, please give me some time. Lolz! I couldn't stand straight. We sat and had a chat. The feeling still hasn't sunk in for me. I was still looking at the medal. Trying to figure out how I did what I did. Or was it all just a dream... Took some snaps and decided it was time to go home. On the cab back home, the cabbie had questions again. lolz! 'What was the race all about, walking or running, how many kilometers' etc. And I bragged. I bragged it was 21km. And also that I was the last to finish. Hey, finishing last is definitely something to brag about! When I reached back home, J and kids were out. I took a quick photo of myself again and just fell on my bed. I waited for my kids to be home and show them my medal. Whenever Talha sees me training, he would say 'Umma strong!'. haha! My little dude was proud of me. He wanted both my medal and Addidas bracelet. I hugged both my kids and bragged about everything to my husband. Took a shower and fell on my bed again. For a nap this time. For a much needed rest. I would like to thank Samantha, Anja, Tania and Megha for being there for me, for supporting me and pushing me. Thank you Audrey for sticking with me till the end. I would also like to thank everyone at DCS for being such a huge support team and for organizing everything so well. Each of you have helped me reach a huge milestone in my life. I can't thank you enough. Words fail me! If you are a runner or thinking of running, if you are worried about what people would say or those idiots on the streets who gawk for no reason - don't worry. Don't you dare worry! Do what you have to do for yourself. Take care of yourself and your health first. Don't think about what others are going to say or think about you. It's your body, your health and happiness that matters. Rest comes later! I think that covers everything. Phew! See you soon, Insha Allah. OMG...that was an awesome post Neelu...Congrats my dear..you have all the rights to brag and brag about it...your post is a real motivator. I love this blog!! You are my new hero! I am SO proud of you! Look what you've accomplished over the past 3-4 months. I hope you'll continue with your running. Now you've gotten your first half marathon outta the way... the sky's the limit! Very nice posting, I felt with you. I think, you´ve learned a lot about yourself and this experience will be with you your whole life and will let you forget every weak moment coming inshaALLAH. Congrats,neelu! You are such an inspiration. And your dedication is admirable. I too wanted to participate in dubai women's run (I wouldn't even dream of 21km) . But the last time I ran a race was in school. There are so many things tieing me down at the moment but in sha allah, hoping to participate next year. Thank you ladies!! You are very very kind and I feel blessed to have such an awesome grou of supporting ladies! juz one line "I am proud of you" - that covers it all!!! Hope the next year is also full of achievements and proud moments for you as always. Awesome !! !I could feel the pain, the numbness, the happiness and all the rush of emotions you went through. That's one half marathon off your list. You go girl!! !